Smell the Cork! : I don't know about art but I know what I like. I don't know about art but I know what I like. 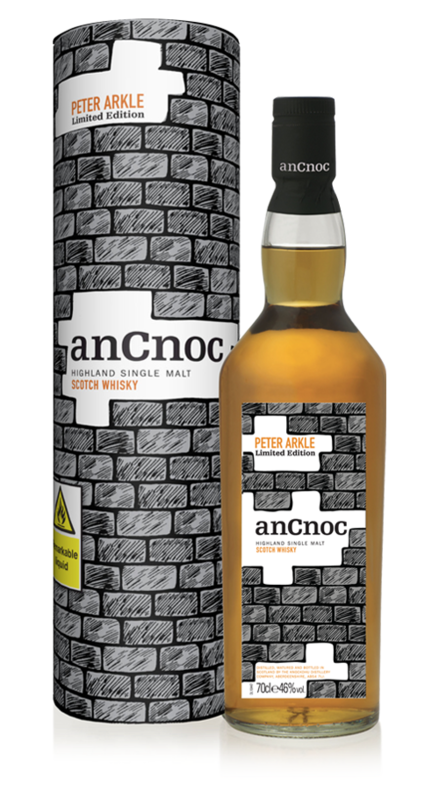 And I rather like this whisky, An Cnoc Peter Arkle "Bricks". The nose is super sweet, in a golden syrup way, with a hint of cedar wood about it. On the palate it's drying, thick, and syrupy, with a little malt in the finish. It takes a generous dash of water superbly well, opening up to show lanolin or beeswax aromas along with biscuity malt, and the palate develops an orange flavour. As I say, I rather like it. But I'm not quite sure what to make of the art work. It is definitely a good thing that the whisky industry is doing well enough to be able to afford the services of talented artists. And, having had a rummage around the web I can say I rather like Peter Arkle's work. But I can't figure out a connection between the liquid in the bottle and the design on the canister. Obviously, the same argument applies to many other whiskies. And if Knockdhu distillery is going to try and make their whisky stand out on the shelf, then using a proper artist is a commendable choice. There isn't any conclusion to this line of thought except perhaps, that not everyone can be as distinctive as Bruichladdich. And to reiterate that I don't know about the artwork but I know that I like this whisky, very much. 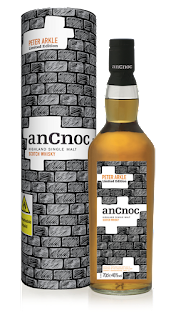 An Cnoc Peter Arkle "Bricks", no age statement, 46%, about £50.